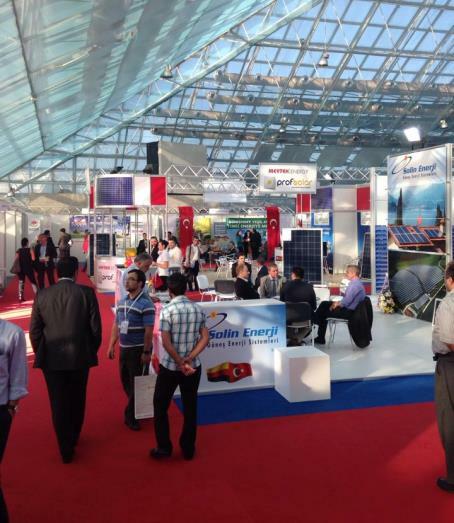 RENSEF Renewable Energy Systems and Energy Efficiency Exhibition was organized in Antalya Cam Piramit between October 31 and November 3. There were 53 exhibitors in the exhibiton from Germany, China, Denmark, Italy, Greece and Bulgaria besides Turkey. RENSEF Renewable Energy Systems and Energy Efficiency exhibition which is the first exhibition about energy industry in the mediterranean region lasted 4 day with expert exhibitors and rich event schedule. The opening ceremony of our RENSEF Renewable Energy Systems and Energy Efficiency Exhibition took place in the auditorium of Cam Piramit in October 31 at 4pm. Institution chairmans made statements within the one hour long ceremony. Those who gave a speech at the ceremony; Agoras Exhibition's General Manager Mehmet Dukkanci, The Chairman of Hotels' Techinical Facility Managers and Directors' Federation Saban Aydogmus Unlicensed Electricity Production Association's chairman Yalcin Kiroglu, 2nd Solar Symposium's Chairman of the Executive board and the board member of The Chamber of Electrical Engineers Antalya branch Ibrahim Kucu, The Chairman of The Chamber of Architects Antalya Branch Osman Aydin, The Chairman of The Chamber of Electrical Engineers Head Office Cengiz Goltas Antalya Metropolitan Mayor Prof. Dr. Mustafa Akaydin, , Turkey Architects' and Engineers' Chambers Unity board member Kubilay Ozbek, Deputy General Manager of Renewable Energy General Directorate Atilla Gürbüz. After the opening ceremony, the opening cocktail took place at Cam Piramit foyer. Akdeniz University Mechanical Group's vehicle Portacar and Bulent Ecevit University Karaelmas Robot Group's vehicle Gunyuzu were exhibited in the exhibition for 4 days. The vehicles attracted university students' attention. They were designed within the universities and they run with solar power. Their projects are updated with developing technology and they attend alternative energy vehicles competitions. Anthea organized the 2nd Solar Symposium in cooperation with The Chamber of Electrical Engineers Antalya Branch and The Chamber of Architects Antalya Branch in Cender Hotel between October 31 and November 2 parallel to the RENSEF Exhibition. Generalizing solar power and producing and using native and new technologies in our country were the main goal and subject. More than 30 speakers gave speech in the symposium. This Page Has been updated at 12.11.2013 and has been read 0 times.